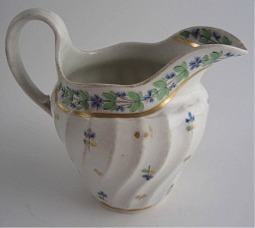 A most attractive Worcester milk jug of the 'Flight & Barr' period, c1795. 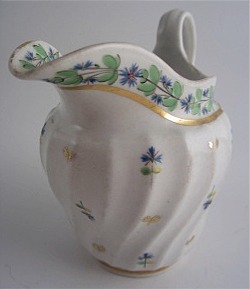 The jug is of the 'waisted' spiral shanked moulded form and elegantly decorated with a cornflower pattern in green, blue and red enamels. 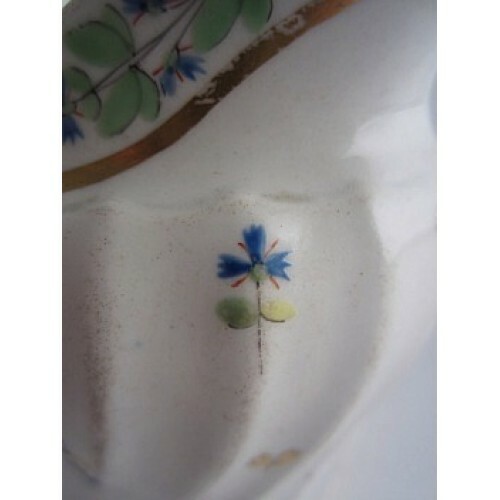 The shanked body of the jug is decorated with single cornflowers executed in blue green and red enamels and further embellished with tiny gilt leaves between the Cornflowers. 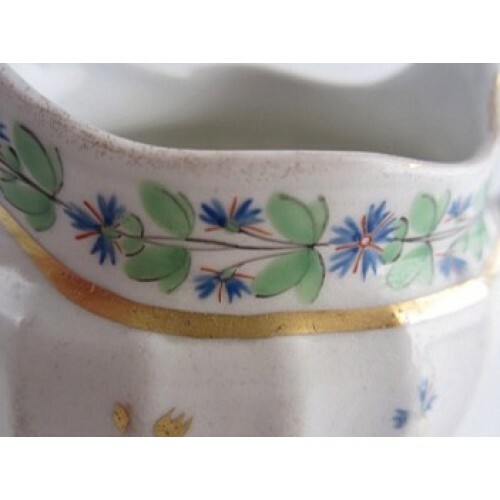 Around the outer rim of the jug is a very pretty border made up of a garland of Cornflowers and green foliage. 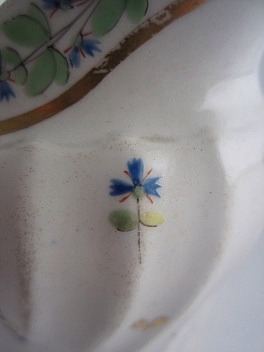 There is a gilt band running round the outer rim of the jug just below the cornflower border. 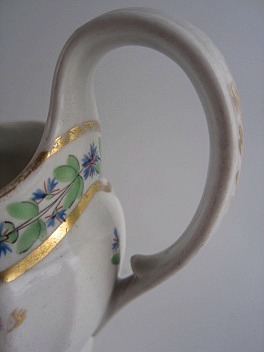 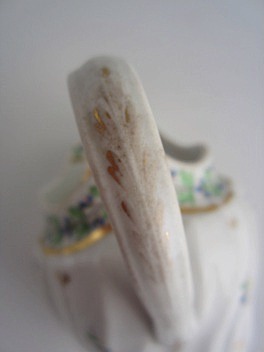 The rim of the jug is also gilded. 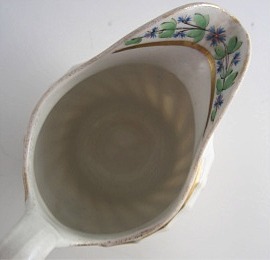 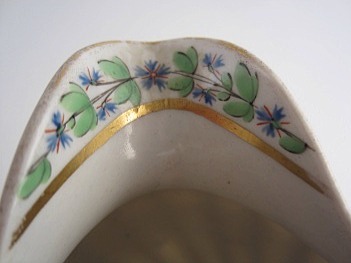 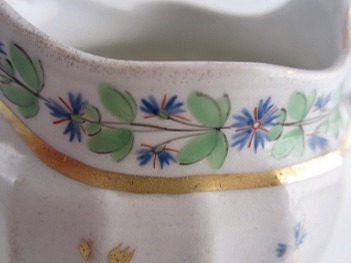 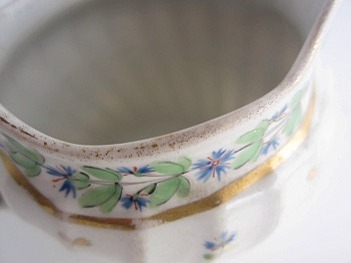 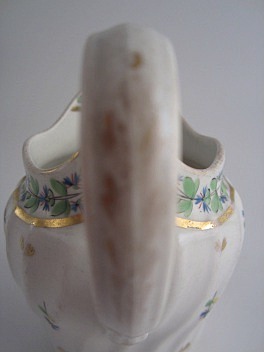 The top of the pouring lip is decorated with the same Cornflower garland that runs around the rim of the jug. 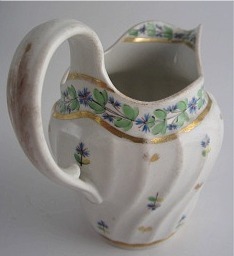 The open loop handle has an inward pointing spur toward the base and the back of the handle is embellished with gilt foliate decoration. 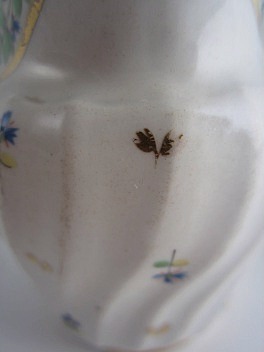 There are no manufacturer's marks on the base of the jug. 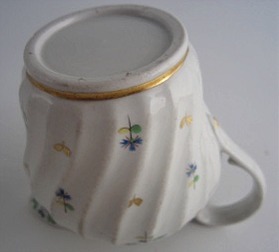 4¼" (105mm) height to the top of the handle. 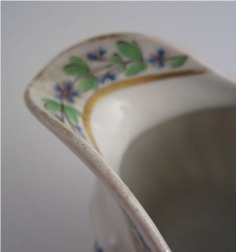 5" (122mm) from the tip of the pouring lip to the back edge of the handle. 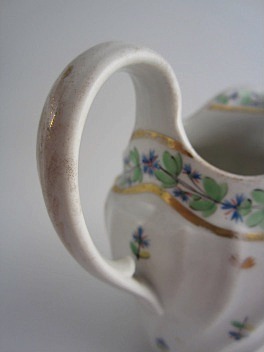 The jug does not have any manufacturer's marks, but is from the Worcester factory from the 'Flight & Barr' period, c1795. 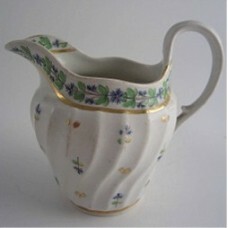 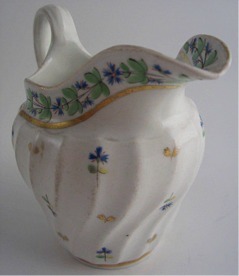 This delightful Worcester jug is in good condition with no chips, cracks, repairs or restoration. 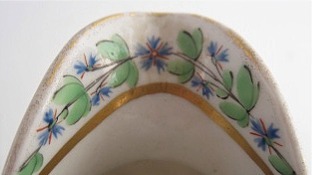 The only minor imperfection is some wear to the gilt decoration. 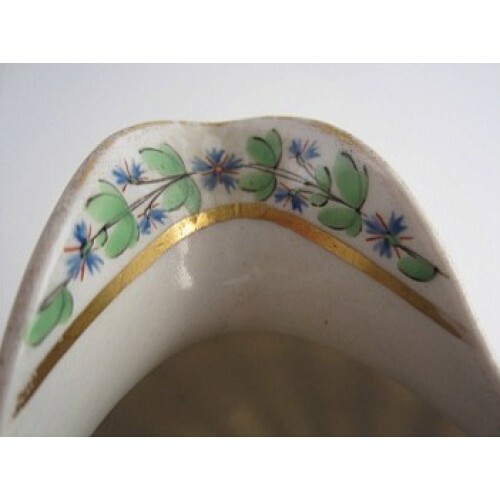 This is mainly to the rim of the jug, the decoration to the back edge of the handle and on high spots of the moulded body (as shown in the pictures below). 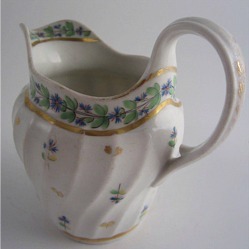 Despite the wear to the gilt decoration, this is still a very fine Worcester milk jug for the collector of Eighteenth century tea wares. 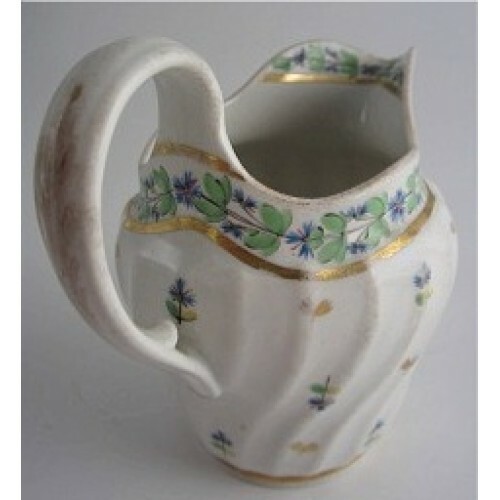 Condition (See main description for full details and pictures) This delightful Worcester jug is in good condition with no chips, cracks, repairs or restoration. 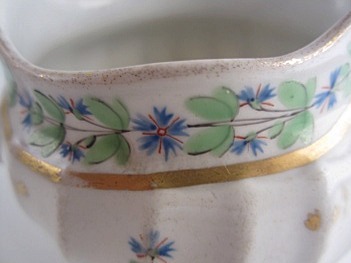 The only minor imperfection is some wear to the gilt decoration. 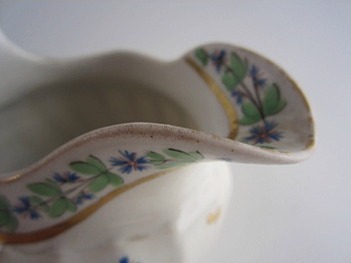 This is mainly to the rim of the jug, the decoration to the back edge of the handle and on high spots of the moulded body (as shown in the pictures in the main description). 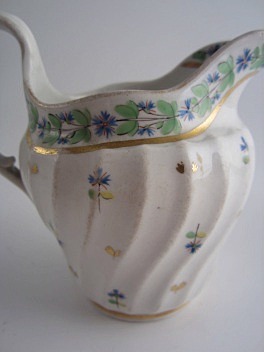 Despite the wear to the gilt decoration, this is still a very fine Worcester milk jug for the collector of Eighteenth century tea wares.